Trying to use the PC utility to update the firmware, but Windows can't find a suitable driver. I'm running Win 7 SP2 x86. Look at the attached picture for the errors I'm getting. Where is the actual driver? I can try to point it to the actual driver in device manager, but I don't know where it would be. I searched C:\Program Files\Line6\AMPLIFi Utility for any .inf or .sys files and didn't find any. Where does the installer actually put the damn USB driver? I uninstalled and reinstalled, but got the same error. Bypassing installation of Interposer. A newer version already exists on the machine. I held the tone and tap buttons when powering up, but the utility still cannot connect to it. Ok, completely uninstalled, rebooted, reinstalled, swapped out the USB cable and now its working. The utility didn't even ask me to put it in update mode it just updated it. Working great now. Had I troubleshot this in stages I could have identified the specific problem, but I believe it was the USB cable- I don't think the reboot made a difference. Just to be clear I'm not entirely sure the cable I first tried itself was not bad- I didn't test it with another device to confirm. I am having the same issue. I've tried 3 different usb cables and the seem to work on all other devices. It keeps telling "error/read please do not disconnect or reconnect your usb. Same issue, except I am using AMPLIFi 75, My first cord was in questionable status as it sat in my garage for years, So I bought another one from Wal-Mart. Im not certian the first was faulty but the new one shouldn't be. It worked enough to show me that my amp was indeed connected by my amp never updates, Read error occurs. Was there anything else I was supposed to download besides the Amplifi Utility. I guess if you got it to work please give me better detail on how you did so. Mine donÂ´t update firmware. IÂ´ve tried two different USB- cables and ports with LINE 6 updater. 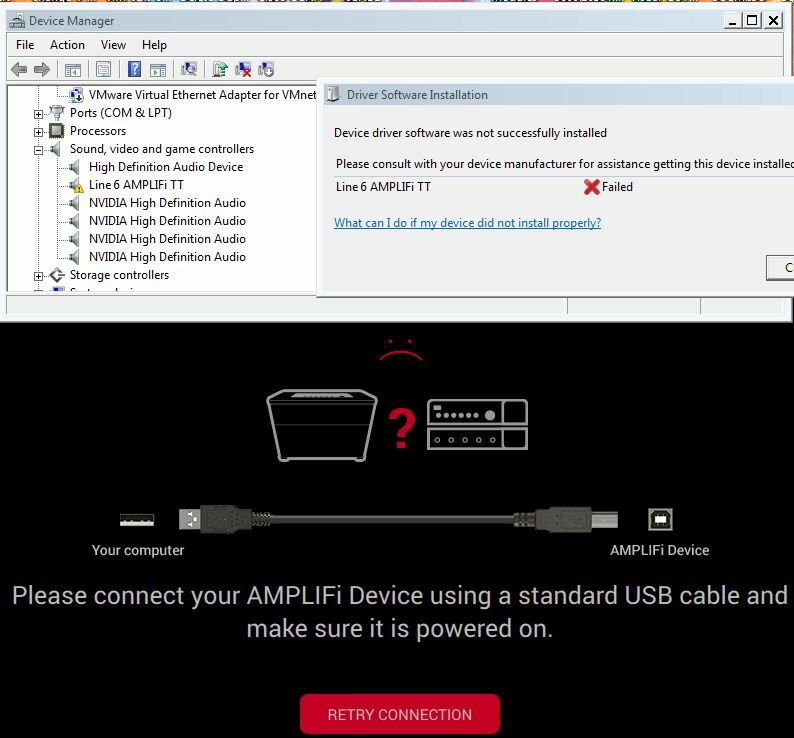 It tells that I have connection to Amplifi TT 2.00 but when trying to install new firmware " Firmware update failed. An error has ocurred. Please try again" text will appear. Also with "Apple App update the App only freezes.